A firefighter directs water from high atop a ladder truck onto a barn that was on fire on Bradner Road on Monday afternoon. 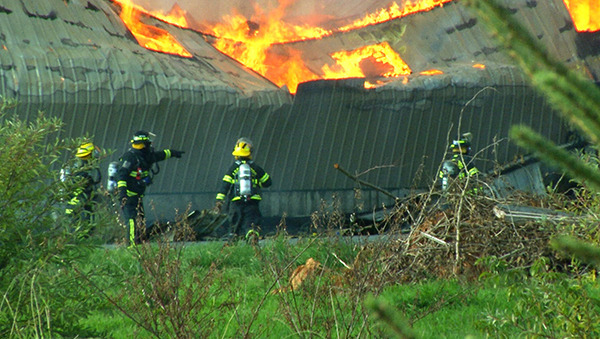 Thousands of chickens were lost in a fire that destroyed two barns on Bradner Road on Monday afternoon, causing damages estimated to be in the millions. 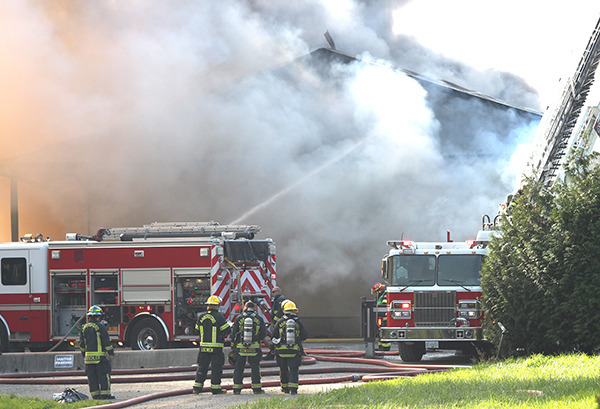 Crews were called just before 2 p.m. to the blaze at 7087 Bradner Rd., just south of McTavish Road. Assistant Chief Jeff Adams of Abbotsford Fire Rescue Service said when crews arrived, the two side-by-side barns were fully engulfed in flames. He said the blaze began in the larger barn, crossed the breezeway separating the two buildings and spread to the smaller barn. Adams estimated the total size of the blaze to be 80 feet by 100 feet. He said up to about 60,000 chickens were lost in the blaze, but no employees of the poultry operation were injured. Adams said it could take a few days for investigators to determine the exact cause of the fire. He said the fire was a difficult one to fight because of its size and the need to use water tenders – trucks used to transport water from outlying hydrants in the rural area to the fire scene. Four tenders were used from Abbotsford, and one from Mission. About a dozen career firefighters and 30 auxiliary members were on scene over the course of the day. Crews cleared the scene at about 1 a.m. Heavy black smoke from the blaze could be seen around Abbotsford and Mission at the peak of the blaze.